So on go the clothes, layer upon layer. 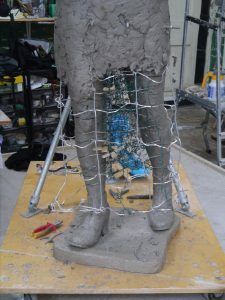 The skirt needs a lot of clay so we build an armature that goes around her legs, liked a hooped petticoat. Then I spend hours adding the more detailed armature – weaving and twirling the wire – that will ensure the clay doesn’t fall to the floor. It is important that I have the legs in the perfect position and that the ankles are tilted correctly before the skirt clay is applied. This is helped by having a scaled-up chair seat under Emmeline’s feet – and that Sarah, the model, has a life-size chair seat to stand on. The weather is heating up, so each night I apply damp cotton cloths to Emmeline. The morning ritual is to unwrap her and give her another spray with water. Nigel Kingston, the photographer, comes to take the official documentation photos (photos below). 2 Responses to "Our Emmeline: the clothed figure – I"